With a unique glass pattern and simple base, the Westcap bath collection is contemporary with a twist. The beautiful waving pattern of the thick clear glass is accented by the sandblasting on the inside. The satiny Brushed Nickel completes the look. Product warranty: limited warranty: electrical components [10 years], finish – indoor & outdoor [3 years], coastal armour – outdoor finish [5 years]. The fixture is lovely. I was a bit disappointed that the LED bulbs weren’t as warm as they appear in the picture, but apparently this unit will take incandescent bulbs which is a great bonus. This is a very well made piece. The only things keeping it from a 4 star rating are that the ceramic threads for the light covers were slightly damaged/flaking on one fixture and the kit did not come with the hardware needed to hang it (no screws). I absolutely went through all of the (excellent) packaging and these items were not included. Luckily we are relatively handy/experienced and were able to pick up the correct screws. Shipping was fast, packaging was decent, although the box was split at one seam. I will post pictures when the bathroom is complete, but in terms of overall appearance and construction this is a wonderful piece and I’m glad I purchased it in spite of some minor hiccups. 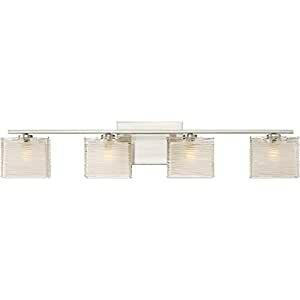 Very nice light fixture, elegant, classic looking, also very good service of this seller, they helped very quick with the broken parts. Highly recommended! !